With spearfishing getting more and more popular, it’s important those getting started know what to look for in a speargun. It’s all well and good to want the bells and whistles of a top-of-the-line speargun, but I want to let you in on a little secret. There’s plenty of great spearguns around that’ll set you back less than $100. Just because you’re buying a cheap speargun, it doesn’t mean it’s not going to help you catch a feed of fish. With the help of a few friends, we tested the cheapest spearguns we could find. Or more accurately. We wanted to see how fast we could get a cheap speargun to break, while also putting them through a series of accuracy and distance tests. 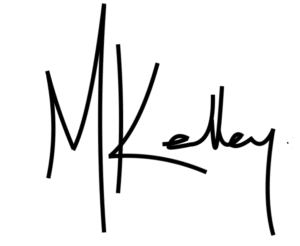 I wasn’t all that surprised with the results, as they reflect what most of the industry has been saying for a long time, along with my personal experience after decades in the ocean. Right. Now onto the list. Beuchat has found that perfect balance between quality and affordability, and as a result it’s easy to understand why they’re at the top of our list as the best cheap speargun on the market today. Their spearguns are great. Easy to use and manoeuvre underwater, the thinner shaft provides a power boost while minimising the hole your shots leave in the fish. My only advice would be to shorten the factory rubber it comes with for a little more power, and perhaps even fit a second rubber to give your shots a little more distance. 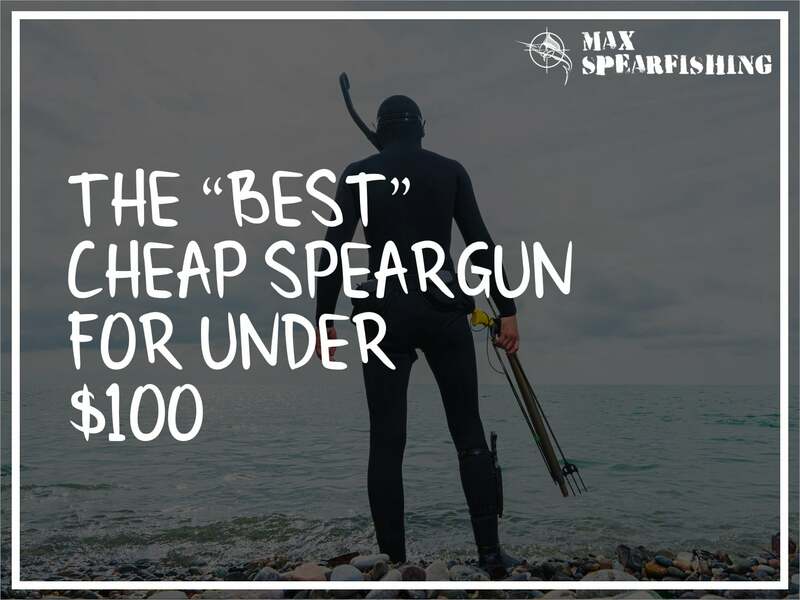 You’re not going to find a better deal than this cheap speargun. Of course, there’s a few others we tested to find the best cheap speargun, you can see the results below. With a high-strength stainless steel shaft and trigger, the JBL Carbine is also a good choice for a cheap speargun. 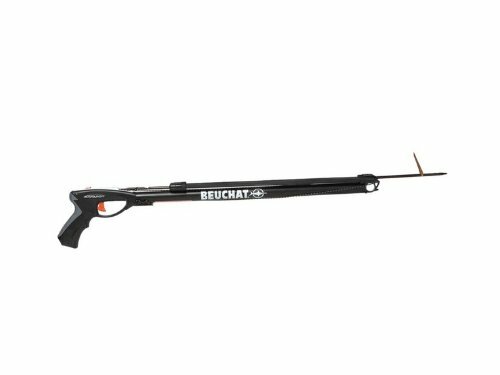 At 27″ (roughly 68cm) it’s a little shorter than the Beuchat Espadon Sport, but it’s a great little speargun for the price. In our tests it was accurate up to about 10 feet, which is about as good as you can expect when you’re buying spearguns in this price range. You will need to shorten the factory bands though to ensure your shots actually pierce the fish at these distances, but all-in-all it’s a great introductory speargun. Oh, and make sure you’ve got a file handy. The speartip you’re given with the setup is rather dull, it’s worthwhile getting this to a nice point before your first hunt. The Carbine Series delivers more bang for your Buck than anything in its class. With the Cressi Apache I was suitably impressed, and it sits third in our list as a cheap speargun. 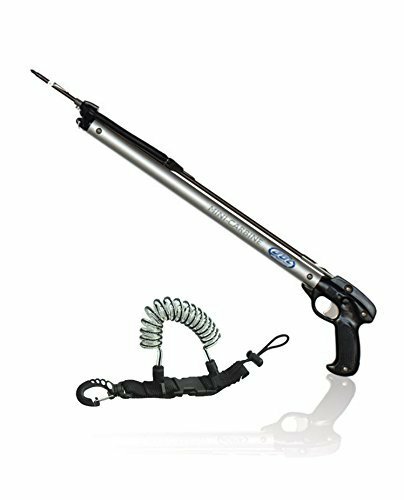 It’s also one of the lightest spearguns you’ll find at this price range, which makes it super easy to track and handle in the water. There is space for a second band to be added for a boost in power, and we were able to accurately shoot at about 7 to 8 feet. Not bad considering the gun we were testing was only 18″ (roughly 45 cm). If you’re looking for a cave gun this would be the speargun I recommend, as it’s perfect for getting into tight spaces to hit those big cod and other fish hiding out of sight. The SEAC New Sting is another good choice for a cheap speargun, and at 65cm it’s comparable to the JBL Carbine. What I didn’t like was the shaft, as it’s a thick 7mm but it’s a little softer than the others in this category. I do need to mention a warning here, as many buyers of this gun have seen problems with the trigger mechanisms misfiring. This shouldn’t happen, and if you find your gun is malfunctioning your best course of action is to return it and get it replaced under the manufacturers warranty. I bought a SEAC New Sting especially for this test, and despite my best efforts, I wasn’t able to actually get it to misfire. Believe me, I tried. Barrel in extruded anticorodal aluminium. I’m actually a big fan of Mares, and their Bandit speargun is a great cheap speargun for beginners. At 45cm it’s one of the smaller ones you’ll get under $100, which is also why it’s a little further down the list. You will need to add a second band to the gun if you want it to have any sort of power, the factory setup is only good for a few feet, though shortening the band it comes with should get this up to an effective range of 6 to 7 feet. I didn’t like the way the speartip is setup (it’s a tri-cut tip), so you may want to get a file out before you go diving and round these out a little. It’ll help the spear penetrate the fish better. What to consider when buying a cheap speargun? Spearfishing is a great hobby, but when you’re just getting started or cash is tight, it can be hard to justify dropping hundreds of dollars on a speargun. I get it. When I first started spearfishing 30 years ago all I could afford was a pole spear. Here’s our list of the best pole spears on the market today, and these days there’s also many options for a cheap speargun. I’m glad times have changed. But before you drop your hard-earned cash on the cheapest speargun you can find, there’s a few things to look out for. Because no one wants to buy a dud. When you start looking at cheap spearguns, what you need to pay attention to most is the size of the barrel. Small spearguns do have their place in cave diving or in around the rocks on shallow hunts, but they can be difficult to use. As a big guy, I actually struggle loading smaller spearguns, because I can’t get enough leverage with a 45cm or 55cm speargun. It’s just too awkward for me. A shorter barrel length also affects the power of your shots. 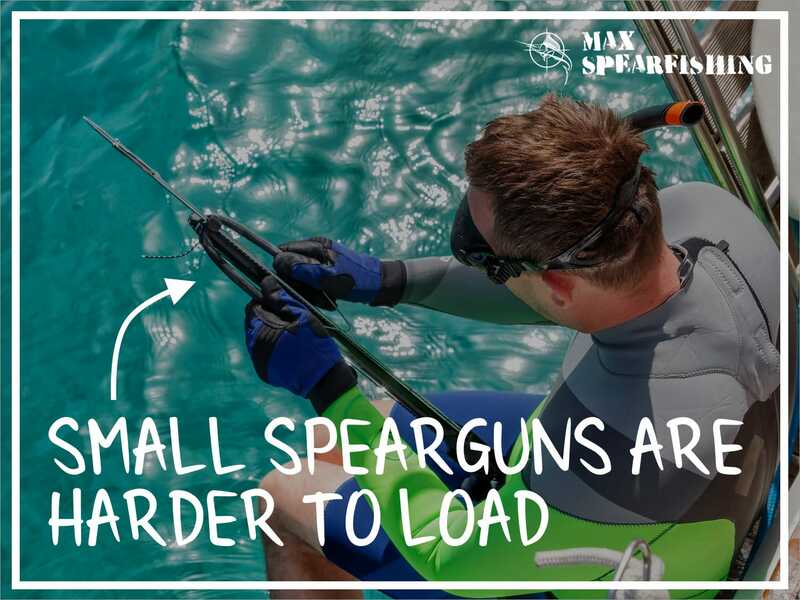 The shorter the barrel, the less tension you’re going to be able to put on the speargun, which means you’re going to have less force behind your shots. So you’ll miss more fish. In some of our tests the factory bands even resulted in the spears bouncing off our target. Which is crazy. It’s a fricken wicker target we were shooting at. But with a cheap speargun the size does matter. My advice, is to get at least a 75cm model or higher. 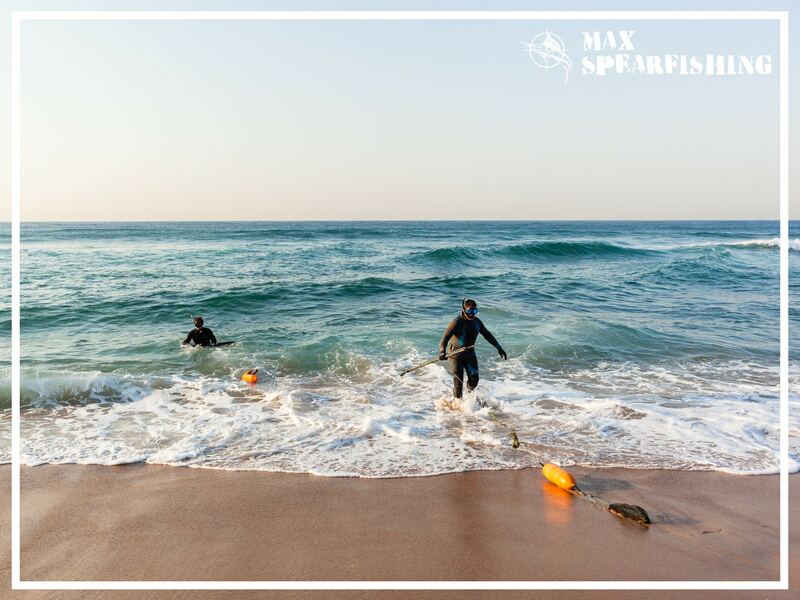 We touched on this in the last section, but you really need to consider where you’ll be spearfishing before buying a speargun. I’ve got a small pneumatic speargun that I love for cave diving, but it’s not really practical for much else. If you’re looking to hunt in the wash of the breakers, searching in the cracks and shooting the fish hiding in caves, a smaller speargun is actually what you want. It’s easier to position and aim, and you’re likely to only be a couple of feet away from the fish you’re targeting. So you don’t need an insane amount of power. Actually, too much power here is a bad thing, as it’ll blunt your spear tip faster, and perhaps even bend the shaft which will render your speargun useless. And even though you bought a cheap speargun, you don’t want it to break on your first dive. When you’re looking at buying a cheap speargun it’s important to pay attention to the trigger mechanism. This is usually the first point of failure on all spearguns, and misfires can be deadly. A misfire is when your speargun goes off unexpectedly. Perhaps you were able to squeeze the trigger and the speargun released while the safety was ON, or you were able to shake, rattle or knock the handle and get the gun to fire. 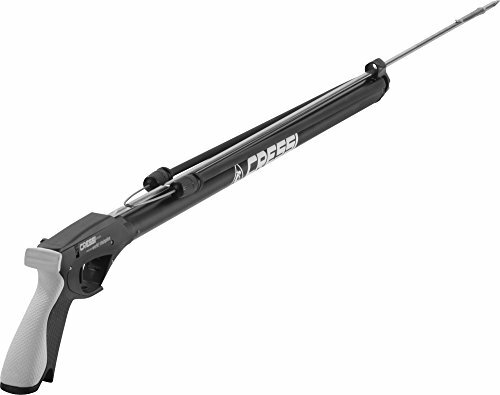 What you want to find is a cheap speargun that still uses a stainless steel trigger mechanism. It’ll hold up far longer than the moulded plastic a lot of brands use on their entry level spearguns, while being much safer for the friends you’ve convinced to try spearfishing too. There’s a balance when it comes to the size of a spearguns shaft. The thinner it is the faster it’ll rocket through the water, but it also means it’ll be more prone to damage if it’s shot into a hard object, like the rock wall directly behind the fish you’re targeting. For the most part, you’re not going to get the finest quality “spring steel” shafts on a cheap speargun, but we did notice a lot of variance in the models we tested. The Beuchat Espadon Sport was the clear winner, though the high-strength shaft on the JBL Carbine puts this speargun at a close second. All up we put five cheap spearguns to the test for this review. Straight out of the box I have to tell you that the distance you’ll get with a cheap speargun just doesn’t compare to what you’ll get by spending just a couple of hundred dollars on one of the best spearguns in the market, but that’s neither here nor there. All of the spearguns we tested had no problems with accuracy up to about 7 feet, and you could push this out to 10 to 12 by shortening the bands. Personally I felt like I got the best “kick” out of the JBL Carbine and the Beuchat Espadon Sport, as the thicker shafts on the other cheap spearguns seemed to rob them of a little power. We did end up shortening all of the bands to see how much of a boost they could get, and the Beuchat was the clear winner. Just because you’ve not got hundreds of dollars to spend, there’s still plenty of great spearguns available for under $100. The trick is to do your research, and listen to the “old salts” like me who’ve put these spearguns through the works to recommend the best for you. I truly hope you can find a great speargun, even if it is a cheap speargun, and you get out in the water on your first dive soon. There’s nothing in the world quite like spearfishing, and nothing makes me happier than seeing all the new people trying it out. Let me know how you go, and I’d love to see a pic of your first fish.